This section deals with systems that are generally found on multiengine airplanes. Multiengine airplanes share many features with complex single-engine airplanes. There are certain systems and features covered that are generally unique to airplanes with two or more engines. Feathering is necessary because of the change in parasite drag with propeller blade angle. [Figure 12-3] When the propeller blade angle is in the feathered position, the change in parasite drag is at a minimum and, in the case of a typical multiengine airplane, the added parasite drag from a single feathered propeller is a relatively small contribution to the airplane total drag. Figure 12-3. Propeller drag contribution. At the smaller blade angles near the flat pitch position, the drag added by the propeller is very large. At these small blade angles, the propeller windmilling at high rates per minute (rpm) can create such a tremendous amount of drag that the airplane may be uncontrollable. The propeller windmilling at high speed in the low range of blade angles can produce an increase in parasite drag, which may be as great as the parasite drag of the basic airplane. 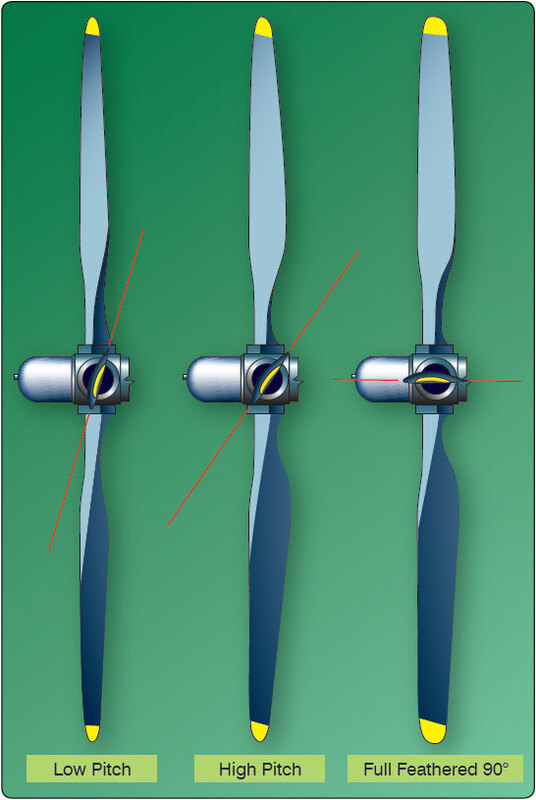 As a review, the constant-speed propellers on almost all single-engine airplanes are of the non-feathering, oilpressure- to-increase-pitch design. In this design, increased oil pressure from the propeller governor drives the blade angle towards high pitch, low rpm. In contrast, the constant-speed propellers installed on most multiengine airplanes are full feathering, counterweighted, oil-pressure-to-decrease-pitch designs. In this design, increased oil pressure from the propeller governor drives the blade angle towards low pitch, high rpm—away from the feather blade angle. In effect, the only thing that keeps these propellers from feathering is a constant supply of highpressure engine oil. This is a necessity to enable propeller feathering in the event of a loss of oil pressure or a propeller governor failure. To feather the propeller, the propeller control is brought fully aft. All oil pressure is dumped from the governor, and the counterweights drive the propeller blades towards feather. As centrifugal force acting on the counterweights decays from decreasing rpm, additional forces are needed to completely feather the blades. This additional force comes from either a spring or high-pressure air stored in the propeller dome, which forces the blades into the feathered position. The entire process may take up to 10 seconds. 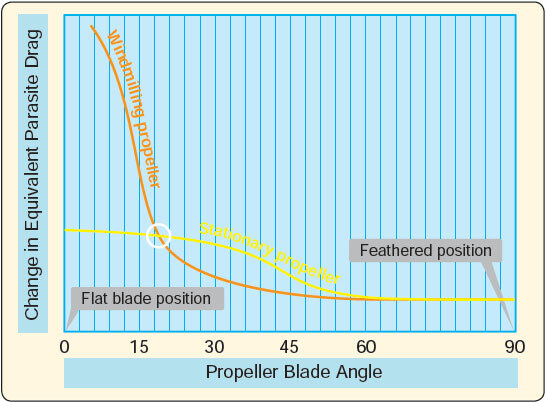 Feathering a propeller only alters blade angle and stops engine rotation. To completely secure the engine, the pilot must still turn off the fuel (mixture, electric boost pump, and fuel selector), ignition, alternator/generator, and close the cowl flaps. If the airplane is pressurized, there may also be an air bleed to close for the failed engine. Some airplanes are equipped with firewall shutoff valves that secure several of these systems with a single switch. Completely securing a failed engine may not be necessary or even desirable depending upon the failure mode, altitude, and time available. The position of the fuel controls, ignition, and alternator/generator switches of the failed engine has no effect on aircraft performance. There is always the distinct possibility of manipulating the incorrect switch under conditions of haste or pressure. To unfeather a propeller, the engine must be rotated so that oil pressure can be generated to move the propeller blades from the feathered position. The ignition is turned on prior to engine rotation with the throttle at low idle and the mixture rich. With the propeller control in a high rpm position, the starter is engaged. The engine begins to windmill, start, and run as oil pressure moves the blades out of feather. As the engine starts, the propeller rpm should be immediately reduced until the engine has had several minutes to warm up; the pilot should monitor cylinder head and oil temperatures. In any event, the AFM/POH procedures should be followed for the exact unfeathering procedure. Both feathering and starting a feathered reciprocating engine on the ground are strongly discouraged by manufacturers due to the excessive stress and vibrations generated. As just described, a loss of oil pressure from the propeller governor allows the counterweights, spring, and/or dome charge to drive the blades to feather. Logically then, the propeller blades should feather every time an engine is shut down as oil pressure falls to zero. Yet, this does not occur. Preventing this is a small pin in the pitch changing mechanism of the propeller hub that does not allow the propeller blades to feather once rpm drops below approximately 800. The pin senses a lack of centrifugal force from propeller rotation and falls into place, preventing the blades from feathering. Therefore, if a propeller is to be feathered, it must be done before engine rpm decays below approximately 800. On one popular model of turboprop engine, the propeller blades do, in fact, feather with each shutdown. This propeller is not equipped with such centrifugally-operated pins due to a unique engine design. An unfeathering accumulator is a device that permits starting a feathered engine in flight without the use of the electric starter. An accumulator is any device that stores a reserve of high pressure. On multiengine airplanes, the unfeathering accumulator stores a small reserve of engine oil under pressure from compressed air or nitrogen. To start a feathered engine in flight, the pilot moves the propeller control out of the feather position to release the accumulator pressure. 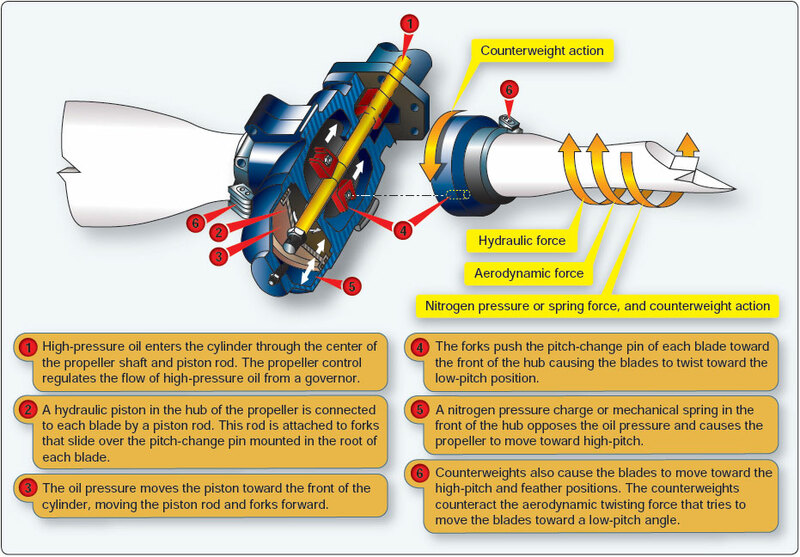 The oil flows under pressure to the propeller hub and drives the blades toward the high rpm, low pitch position, whereupon the propeller usually begins to windmill. (On some airplanes, an assist from the electric starter may be necessary to initiate rotation and completely unfeather the propeller.) If fuel and ignition are present, the engine starts and runs. For airplanes used in training, this saves much electric starter and battery wear. High oil pressure from the propeller governor recharges the accumulator just moments after engine rotation begins.